Jax sat down with black and brown to come to a deal about who would take control of what now that the Chinese were scrambling on Sons of Anarchy Season 7 Episode 12. But the Irish weren't willing to follow the plan unless Jax was willing to solve a problem for them. Elsewhere, Jax faced a vote concerning Jury's death but he refused to tell anyone in the club the outcome. Jax finally told Unser the truth about Gemma and he ran to try and save her when they learned she'd gone to see her father. At her childhood home, Unser begged her to let him take her in and arrest her to save her life but Gemma would have none of it. When Jax arrived, Unser refused to leave, saying that he had nothing left. In prison, the Chinese attempted to use Juice to kill Telly but Juice turned the tables. He gave Telly the heads up and asked Telly to kill him instead. Telly made quick work of the job after letting Juice finish his last piece of pie. You won't want to miss one moment of the mayhem. 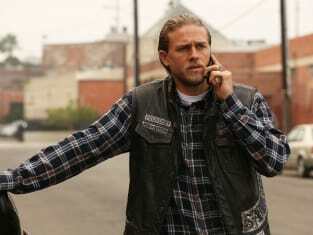 You can watch Sons of Anarchy online here at TV Fanatic.